Eight storeys above the hustle and bustle of Biscayne Bay, with a breath-taking view of the Miami skyline, it’s not hard for Dr Kiran Akal, CEO, Smaks Luxury Group to feel like he’s sitting on top of the world. A reaction that is symbolic of the rise to fame that the Smaks Luxury Group has recently undergone. Smaks began as a luxury gift shop manned by the matriarch of the Akal family in 1979, but moved into the tea business in 2011. “On my return to Trinidad, I learned that my mother wanted to sell the boutique that she had run for about 35 years. I felt a deep sense of loss, because here I was working with all these companies and developing their brands, so there must be something I can do for my family’s business,” Kiran recounted. As a child, Kiran accompanied his mother on most of her buying trips. As an adult, he spent his formative years studying and living in Europe. Overtime, Kiran became increasingly exposed to fine products and gained a greater appreciation for luxury branding and marketing. The idea for Smaks Bespoke Teas started as joke suggested by Kiran’s sister, given his undeniable love for the beverage. Kiran, however, thought it was a brilliant idea. Kiran saw an opportunity to take the tealeaves from one part of the world, one aspect of West Indian history, and combine them with the very essence of Caribbean life. With that, he set about telling the tale of two Indies, East and West, and bringing them together to create a new chapter in Caribbean history. Today, Smaks is the Caribbean’s premier luxury tea brand with eleven teas in the company’s product range. They have won several international awards, and were also presented to Queen Elizabeth II for her Diamond Jubilee. However, as Kiran began to work with tea, he realised the potential for the company to innovate using the aromatic beverage. Kiran had the desire to create a tea company with a unique model, that would appeal to people all over the world simply because the company was the only one doing it. This model was one of luxury, quality and innovation, and with this ambition Smaks Chai Rum, the world’s first tea-infused rum, came about. With the creation of the Chai Rum came several opportunities for the SMAKS Luxury Group, two of which set the foundation for a whirlwind global encounter. First, the company participated in Anuga, the global food fair for the retail trade and the food service and catering market, staged in Cologne, Germany. Participation at the show has opened new export markets for Smaks. In addition to the Caribbean market, the company is now distributing to Europe, specifically Austria, Belgium, Denmark, France, Sweden, Switzerland and the United Kingdom. The company is also in discussions with buyers in Germany and Italy. The other major achievement for Smaks Chai Rum was catching the attention of and securing a deal with Camper and Nicholsons International, the world’s largest yacht brokerage. As a global brand partner, Chai Rum will be poured at some of the company’s most prestigious events, including the Formula 1 Monaco Grand Prix. 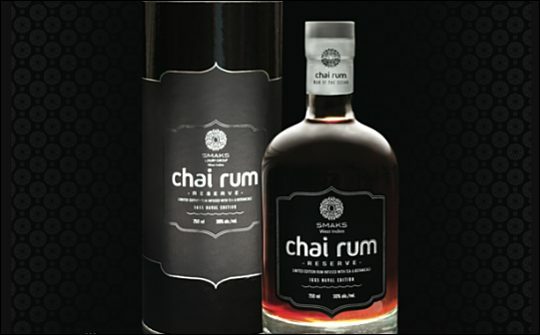 Chai Rum won silver at the Wine & Spirits Wholesalers of America at Caesars Palace in Las Vegas, an accomplishment that will no doubt open the US market for the luxury brand. Smaks first became a beneficiary of Caribbean Export in 2011, shortly after he had introduced Bespoke Teas to his company’s brand. Following Design Caribbean, Kiran entered and won Caribbean Export’s pilot launch of its business competition, Break Point, in Grenada in 2012. He was also given the opportunity to pitch his product to investors in the finals of the competition in London. Smaks also received a Direct Assistance Grant that year, to assist with the re-branding of the business and facilitate e-commerce. Building a globally recognised brand takes time and comes with its own lessons. Kiran notes that that vision, quality and confidence are at the top of his list. Kiran also believes that regional firms are in a position to maximise their exports with co-operation and innovation. He admonished bigger firms to understand that innovation is important and that working with small entrepreneurs is the way to go. Kiran read medicine at a University in Dublin, Ireland. He has been a creative director and artist for events that include The World’s Fair in Seville, Spain, Bastille Day in Paris, France and Art Basel Miami. He is a composer and artist signed to Warner Music, and is the president and creative director of Infinite Worlds. Kiran has been voted one of the hundred most influential creative thinkers in the State of Florida (Florida International Design Magazine, 2009) and was The Design Center of the America’s Star of Design awardee in 2012. He is also an artist in residence for the Miami Symphony Orchestra.